I've had good and just okay experiences with Lauren Oliver. But I still think she's an incredibly talented author and beautiful writer. I'm excited to check out her first adult novel.. I haven't read anything from Lauren Oliver, but I have a couple of her books. But I am excited to check this one out!! Great pick!! As a huge Lauren Oliver fan, I am so excited for this book. I'm really happy to see that she's writing an adult book because I've been feeling like I'm a bit too old for reading mostly YA. I've really enjoyed all the YA titles I've read from Oliver (Before I Fall, Panic and Delirium) so I'm definitely looking forward to reading her first adult title. I love Lauren's writing and will read anything she puts out. This one sounds interesting. Hmm, could be interesting - I do like a good ghost story. This sounds excellent. I was so disappointed that i missed out on this at BEA, but I'm hoping it will be out soon enough. No way! Lauren Oliver wrote a new book??? I have to get it. She has such a nice writing style. I have not yet read Lauren Oliver...and I'm not a YA fan....but this adult novel sounds like one I'd enjoy. Thanks for sharing! I liked the Delirium trilogy, despite not entirely liking the ending. I am excited to see what this book is like. Definitely excited for this one as well! I even posted it as one of my WoW's too. It's by Lauren Oliver, I mean, come on! I'm interested to see how she does with an adult novel....Can't wait!! I've seen this one around! I absolutely love Lauren Oliver. 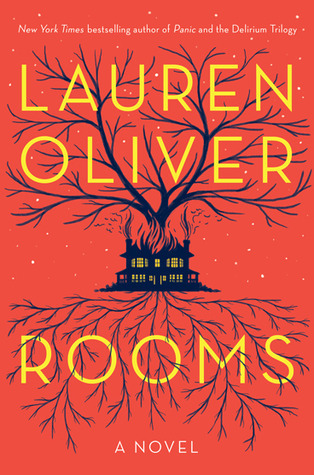 This one looks thrilling, and i hear that Lauren Oliver is a great writer so hopefully it's as good as it sounds. Great pick! I enjoyed her Delirium trilogy but didn't love it. Still excited to read her adult work! I love Lauren Oliver, and I absolutely can't wait for this book to come out. Nice! Haven't read this author but hear good things! Hope you enjoy it! I really like Lauren Oliver's writing and am looking forward to seeing what this book has to offer :) I hope you enjoy it! You ought to continue it on your mind the fact that the documents contain wash shapes and even upright creases, then again, generally if the replica watches happens to be an important Bogus then simply steps developing fuzzy and poor authoring. The procedure may be to come an important torch in the sit back and watch hands and fingers for about 50 no time. Another item can be done may be to have that sit back and watch at a dreary community and be able to take notice of the hands and fingers. LumiNova is known as a materials which can be layered with the hands and fingers in replica watches. It causes them all glow even while they are really on dreary rolex replica. As a consequence, assuming you have a genuine Make Heuer ınside your hands and fingers, it's going to glow in contrast that fraudulent varieties can be gull, darkish glow or even very little glow in the slightest degree. Apart from that, you should also try to look for that glow which can be for the sides belonging to the sit back and watch top. Fraudulent Make Heuers ordinarily have glue filtrate for the rolex replica and various areas belonging to the sit back and watch. One should be aware that the honest varieties you should not use glue of which this fails to offer you any specific preference the fact that the glue should deposit. It's also wise end up inspecting the face area, hands and fingers, face, and even other parts of that watch out for some kind of mud, rolex replica, finger prints, and some kind of allergens.